The Saint Paul City Railway used horse cars for its first route in 1872, but horses were expensive to feed and susceptible to disease and injury. As an alternative, the company tried cable cars in 1888, but an experimental electrical line in Minneapolis convinced both cities to adopt that technology. Converting from horsepower to electricity was a $6-million process that took three years to complete. The transit company fabricated its own poles with distinctive caps to support and guide the overhead wires. The one you see here was originally located just to the east, where the track curved to the south. An interurban line along University Avenue linked the two cities in 1890. Connections grew stronger the following year when the Twin City Rapid Transit Company (TCRTC) united both cities' streetcar lines into one of the most sophisticated networks in the country. made to the park in the late 1880s. In 1893, TCRTC extended a line to the park with an open-air station. 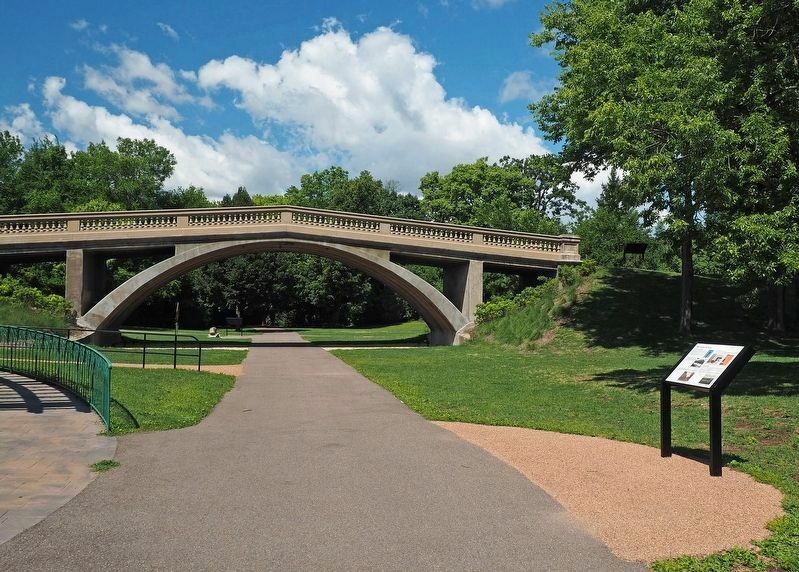 Four years later, Saint Paul permitted the company to construct a line through the park that was part of a high-traffic interurban route. The city agreed to erect a pavilion in Como Park and install other attractions to draw visitors. After the line opened in July 1898, streetcars arrived daily loaded with passengers from both cities. The Como-Harriet-Hopkins line became the longest in the system and was, according to historians John Diers and Aaron Isaacs, "the most scenic, traversing some of the most beautiful neighborhoods in the Twin Cities." "How to See the Twin CIties"
Laying new tracks for streetcars was expensive. To justify the investment, TCRTC wanted the system to be busy on weekends and holidays, not just during the week when commuters kept cars full. To encourage recreational travel, the company promoted "streetcarring"—using the streetcar system for sightseeing and recreation. intersections of cars, trains, streetcars, and pedestrians, thousands of "grade separations" (bridges) were built across America in the early twentieth century. Separations improved safety while speeding up traffic. In December 1902, Saint Paul's park board and the transit company agreed to realign a section of the streetcar route through Como Park and add a second set of tracks. Although extensive construction work would disrupt the park for a short time, the project would shorten the route and remove tracks along Lexington Avenue. Park visitors would be tempted to cross the tracks, inevitably resulting in accidents, so the transit company installed a tall fence between the two sets of tracks. A curved path like the one to your left, west of the depot, led people up the slope to the pedestrian grade separation that opened in 1904. Another grade separation was installed at the same time for automobiles traveling on Lexington Avenue. Caption: Detail of top of guide pole. Caption: A private contractor built Como Park's first streetcar station in 1894. The open-air structure served primarily as a concession stand. Caption: The streetcar's scenic route through Como Park was featured on postcards. Caption: The TCRTC catered to "streetcarring" patrons with special "Sightseer" routes that featured highlights along the way, including Como Park. Caption: With the grade separation provided by the footbridge, visitors could safely cross over the two streetcar tracks to reach the new waiting station, constructed in 1905. Location. 44° 58.7′ N, 93° 8.747′ W. Marker is in Saint Paul, Minnesota, in Ramsey County. Marker can be reached from Lexington Parkway north of Horton Avenue. Touch for map. The marker is just north of the Historic Streetcar Station in Como Park. Marker is at or near this postal address: 1224 Lexington Parkway N, Saint Paul MN 55103, United States of America. Touch for directions. Other nearby markers. At least 8 other markers are within 2 miles of this marker, measured as the crow flies. 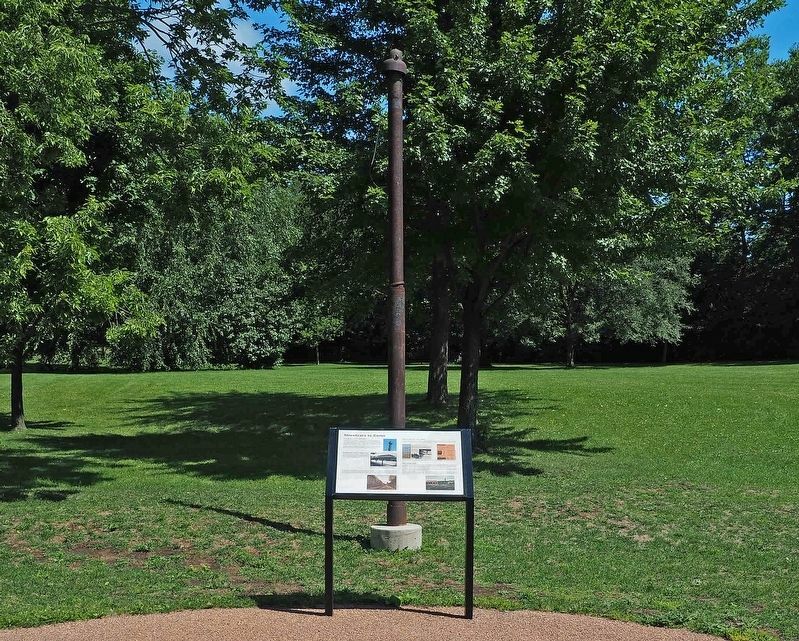 Como Park's Early Years (within shouting distance of this marker); The Melan Arch (within shouting distance of this marker); The Picturesque Landscape (within shouting distance of this marker); The Hamline Plaza (approx. 1.2 miles away); Al Avila (approx. 1½ miles away); Terry Reynolds (approx. 1½ miles away); Kenneth Wayne Stauffer (approx. 1½ miles away); Tom Greenwade (approx. 1½ miles away). Touch for a list and map of all markers in Saint Paul. More. 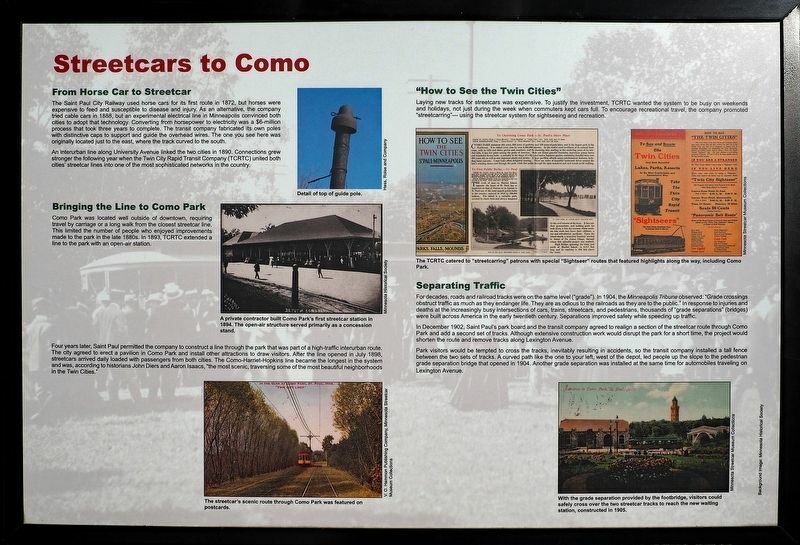 Search the internet for Streetcars to Como. Credits. This page was last revised on March 11, 2019. This page originally submitted on March 7, 2019, by McGhiever of St Paul, Minnesota. This page has been viewed 37 times since then. Photos: 1, 2, 3. submitted on March 7, 2019, by McGhiever of St Paul, Minnesota. • Bill Pfingsten was the editor who published this page.